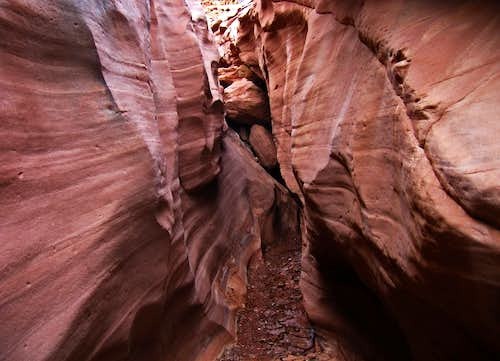 Sheets Gulch is a narrow slot canyon that cuts through the heart of Capitol Reef. The deep Navajo narrows in this canyon are very photogenic especially on a cloudy day when the canyon walls have equal lighting. This canyon is not technical and makes a great adventure with kids. 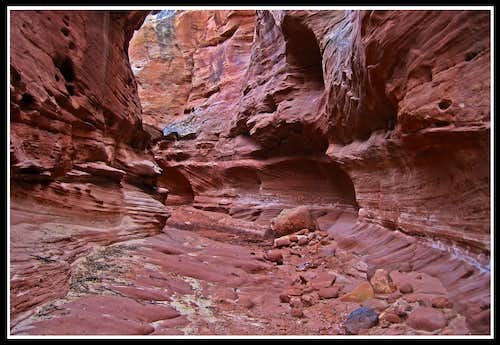 Towards the upper end of Sheets Gulch the canyon walls barely grace the Kayenta Formation. 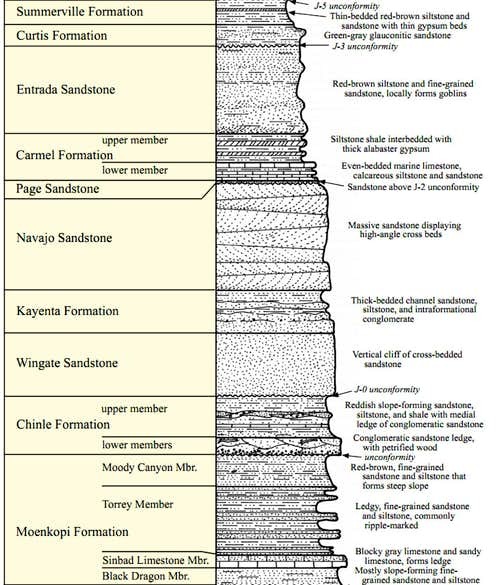 See my strat column! Learn the geology since the geology is the reason that Capitol Reef is so unique and spectacular. If you are looking for a nice walk through yet narrow and scenic slot, this is the one for you! To get to Sheets Gulch from Hanksville Utah, head west on Highway 24 (this highway from Hanksville to Torrey is the best stretch of highway in the world in my opinion due to the perfect display of every rock unit in Utah in one place). Just as you enter the National Park, turn south onto the Notom-Bullfrog Road and head south on the paved road for 10 miles until the pavement ends. Continue on the unpaved road for 2.7 more miles until you see a sign for Sheets Gulch. There is a small parking area on the upstream side of the road or you can turn right just before the bridge and drive upstream in the dry wash for maybe a mile (4WD only) until every vehicle would have to park. Keep in mind that this is road is Bentonite clay which means don't drive on it while it's wet! Although it is possible to drive all 35 miles to the Halls Creek trailhead in a raging blizzard with no visibility with a foot of snow and flowing rivers on the road in a Subaru sedan car in March (That was quite an experience), DO NOT do it!!! When dry, any car can drive this road. Also, if you drive up the wash of Sheets Gulch a little bit, do not park in the wash. Find an elevated place to park. 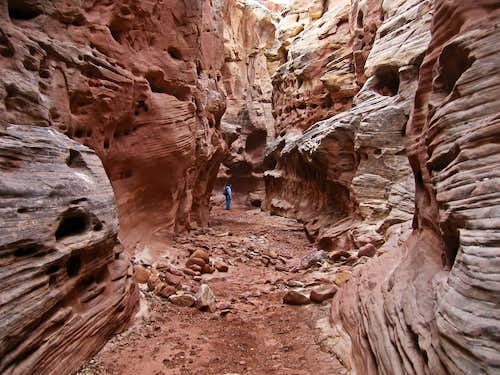 Sheets Gulch itself is a very long canyon (over 10 miles) as it cuts all the way through Capitol Reef so it's not likely you will want to go all the way up into Rainbow draw and Tantalus Flat and back. You will probably want to pick a nice place to turn around or mark a time you want to start heading back. However if you have two cars you can park one as described above and another on the other side of Capitol reef at Tantalus Flat and do a point to point hike. The road down to Tantalus Flat isn't as friendly for passenger cars though. After that small chalkstone the rest of the canyon is an easy walk. Enjoy all the petrified wood and basalt in the canyon as it is extreamly rare for petrified wood and basalt to be seen in a sandstone canyon. If you also look carefully, there are places you can climb out of the canyon mainly on the right hand side and get high above Sheets Gulch and get some pretty impressive views of the massive Navajo Sandstone that makes up the majority of Capitol Reef. 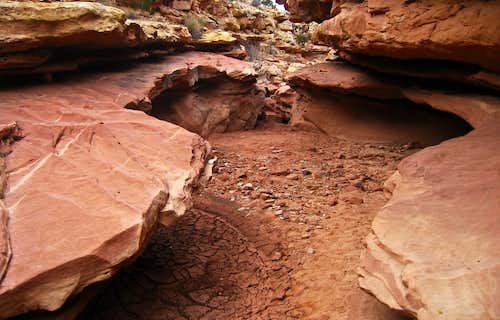 Climb out and also look for the very large Sheets Gulch Arch above Sheets Gulch on the right side. It can be hard to find but for the adventurous it can be done. This is one of the better "secret" camp spots around and no permit required. 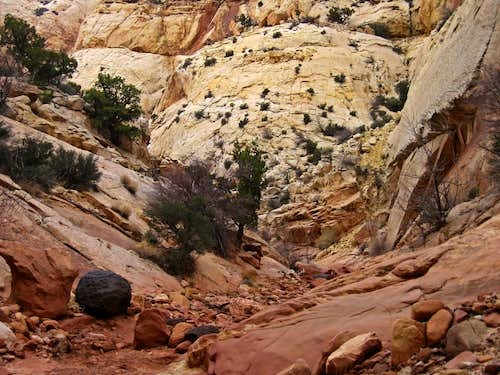 The beauty about Capitol Reef National Park is that there is no entrance fee. 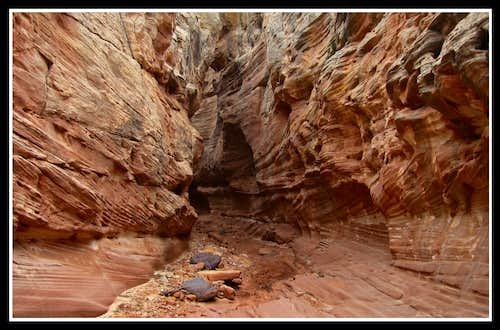 If you're doing Sheets Gulch as a day hike there is no permits or fees. A free permit is required to camp anywhere in the national park that's obtained at the Visitor Center off Highway 24 in Fruita. Leave no trace and don't collect any samples of petrified wood, moqui marbles or basalt!